On Friday 9 June, almost 100 students from local Cardiff schools took part in a unique opportunity to go behind the scenes of Land Rover BAR, the British America’s Cup challenger. Currently in Bermuda, Land Rover BAR, the team led by Sir Ben Ainslie – the most successful Olympic sailor of all time – and joined by Welsh sailor Bleddyn Mon, have been competing in the Louis Vuitton America’s Cup. Six teams were on the water in Bermuda, to battle for the 35th America’s Cup, one of the oldest and most prestigious trophies in sporting history. After a nail-biting round robin, Land Rover BAR went through to the semi-finals where they were sadly beaten by Emirates Team New Zealand 5-2. Land Rover BAR have already committed to challenge for the next (36th) America’s Cup and have secured funding from Land Rover and their sustainability partner, 11th Hour Racing. The Youth Team are currently leading the Red Bull Youth America’s Cup, also in Bermuda. The 1851 Trust, official charity of Land Rover BAR together with Land Rover, the team’s title and exclusive innovation partner and the Bermuda Tourism Authority hosted pupils aged between 11-14, at the Land Rover BAR roadshow, which took place at Cardiff Bay Yacht Club with Stand-Up Paddle-boarding taking place at the Cardiff International Whitewater Centre. With all the racing action taking place in Bermuda the Land Rover BAR roadshow brings the excitement of the America’s Cup to local communities across the UK. 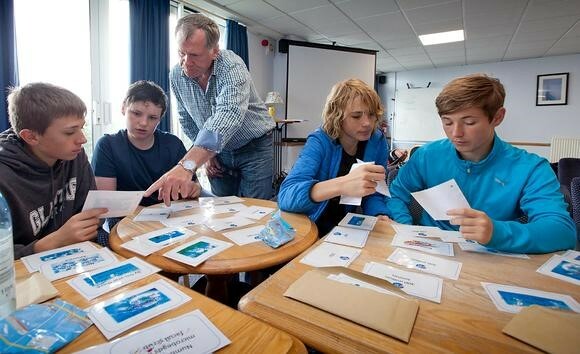 Featuring real life examples of the technology and careers involved in Land Rover BAR’s quest to win the America’s Cup, the day comprised multiple activities each carefully designed to enrich the school curriculum, aiming to inspire a new generation of sailors, designers and engineers. A qualified science teacher taught the pupils about the carbon cycle in a lesson taken from BT STEM Crew, a unique online learning resource developed by the 1851 Trust. The young people also learned about sustainability and ocean health and in particular about the environmental impact of single-use plastics. High on the agenda of Land Rover BAR, ocean health is a relevant and current topic, and it will fall to the next generation to find solutions to the challenges caused by plastic pollution. 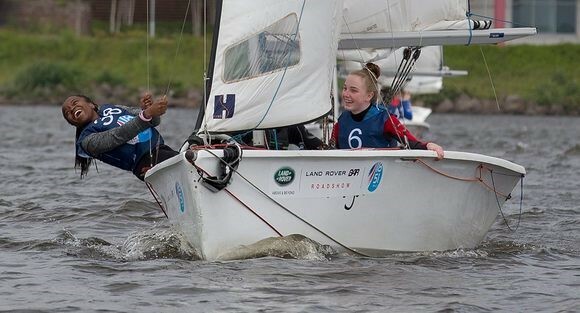 A sailing lesson using dinghies and Land Rover BAR RS Catamarans provided an opportunity to try something new, build self-confidence and develop life skills such as team work and communication. The mobile ‘Tech Deck’ Education Centre allowed pupils to have a go at generating power using a grinder and using the 360-degree virtual reality to experience what it is like to be an America’s Cup sailor. Science, technology, engineering and maths (collectively known as STEM subjects) are vital to the team and race boat development and the pupils were encouraged to appreciate how choosing to study these subjects could open career opportunities they may never have previously known about. After the roadshow, teachers will be able to access additional related learning resources on BT STEM Crew to build on pupil’s enthusiasm during the America’s Cup in Bermuda. Together with Land Rover and supported by the Bermuda Tourism Authority, the Land Rover BAR roadshow will visit a total of five locations around the UK, allowing the 1851 Trust to engage with and inspire almost 1000 young people.